Could it really be May already? 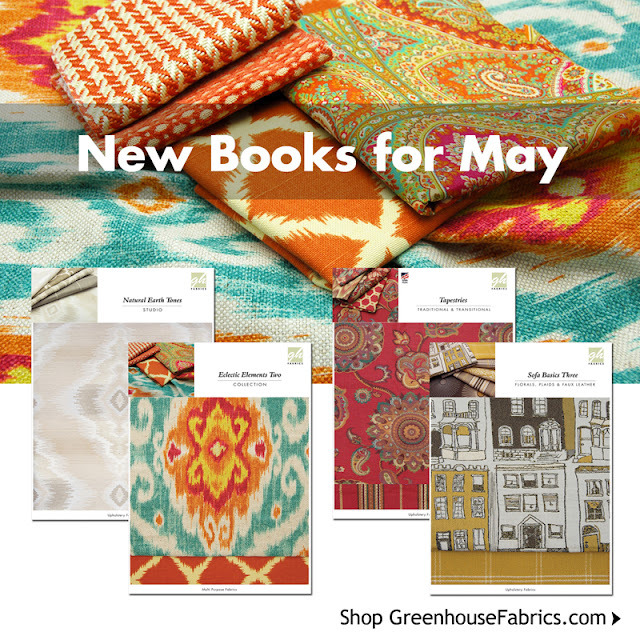 Continuing with our "New Fabrics Every Month" theme for 2012, Greenhouse is excited to showcase our new May Books! January brought 275 Design Colors, February had six new essential upholstery books, March was filled with Prints, Wovens, and more with the Greenhouse Gallery, and April six great new multi-purpose color books! What does May have in store? Four more beautiful books! Each of these books tells a story, like Eclectic Elements Two. The designer Iman, captivates the fabric scene with her rare and distinctive fabrics! The fresh paisleys, IKATs, and ribbon incorporated designs were all initially inspired by her childhood growing up in Egypt. She has taken these memories, the culture she knows today, and aspects of her life as a renown designer and turned them into exotic, bold, and brght fabrics that tell their own stories! On an exciting visit to Paris, the designer of Book B47, who brought these fabrics to life, was inspired by the beautiful yet quaint architecture that fills the city! After viewing the refreshing and innovative displays and colors at the Maison Fabric Show, she sketched images of her surroundings and transformed them into fabrics that bring the Paris design culture to life! Check out the beautiful fabrics we have coming this month and inspire your own stories!